Now after that title at least one person is going “why do I need to praise etiquette in a graveyard!?” . They’d have a right to think that since to most people a graveyard is just a lot of dirt with dozens to hundreds of interred corpses there in. However to those of us that believe that spirits do reside in the place of their rest I believe there should be some form of polite conduct. “polite conduct? what do you mean?” What I mean is that one should think of a graveyard like one would a large apartment complex. Many rooms with many people in them. Most wold enjoy their apartment complex to remain nice and to be respected since most people would like their home to be respected in some form. It can be as simple as a compliment or picking up a spare piece of trash from a careless tenant that may not care as much. Now then take complex and turn it into a graveyard and replace all the doors with tombstones. Though the dead may not speak directly all the time a little consideration of their “home” is still nice. With this said there are very simple rules for graveyard etiquette. One: If it’s a nice and warm day and it hasn’t rained take off your socks and shoes. This might be the strangest of all the ones I’ll list. For this I place myself as one of the many denizens of the grave yard. I wouldn’t exactly be pleased if someone stepped over me with dog crap on their shoe, regardless of my pushing up daisies position. To bring back the complex example would anyone where muddy shoes on a rug or carpet? Two: This one I believe to be a given since a hefty fine follows it if the perpetrator is caught. 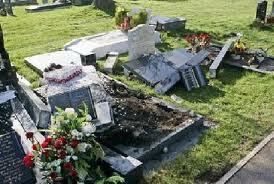 Vandalizing a grave is no different than someone breaking into a house and ransacking the rooms within. In short don’t spray paint a unicorn on a tombstone (or anything else for that matter) or shove them over. Three: Another given is don’t leave trash behind since no one likes a messy house guest. Four: The last one here. Be respectful of the residents at all times. A lot of people go into cemeteries for a quick ghost hunt for a thrill but neglect that, although dead, the residents still have feelings. To add on no going to the cemetery drunk or high. If friends don’t enjoy surprise visits from inebriated guests, I doubt the spirits would either. I know aside from the first one a majority of these should be common sense to anyone entering a graveyard. I just felt that a little etiquette list might help people remember them. After all we may all have common sense but will often need reminders to help us remember that. This entry was posted in First post and recommendations and tagged etiquette, explained, ghost, graveyard, paranormal, spirits. Thank you very much. That is the main point of it anyway. Which reminds me the Kerfauver plot nearby is in need of some maintenance. It’s only a family plot but its not apart of any real graveyard aside from itself. It could use a good bit of tlc about now. 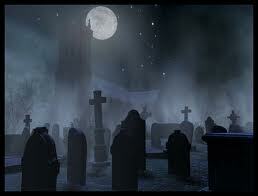 Hmmn perhaps there should be volunteer work to assist the graveyard maintenance workers in the upkeep of graveyards….